By Melissa Lennig on July 5, 2014 . This content contains affiliate links. As an Amazon Associate I earn from qualifying purchases. Lazy summer afternoons are simply perfect for feeling relaxed around the kitchen table engaged in arts and crafts activities that awaken one’s senses and creativity. 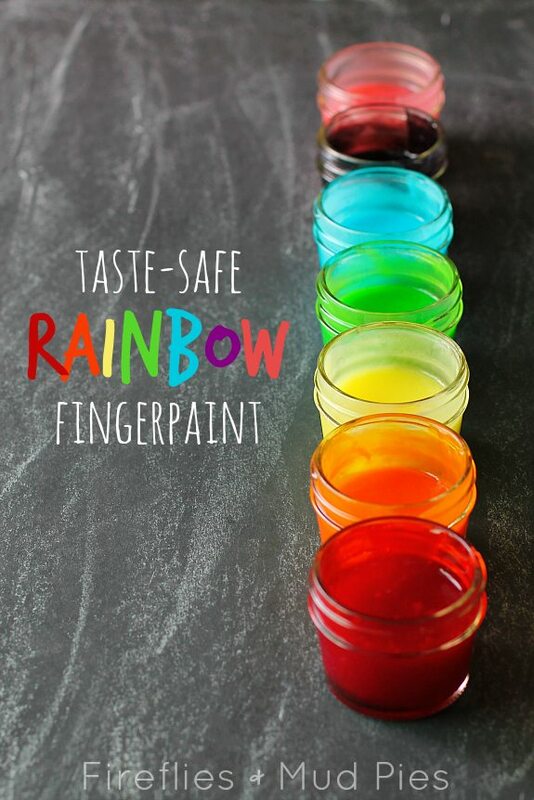 The homemade fingerpaint recipe shared below uses 4 common pantry staples, and dries to a beautiful shine. Scented and colored with a classic seasonal drink, it is the quintessential summer play recipe. 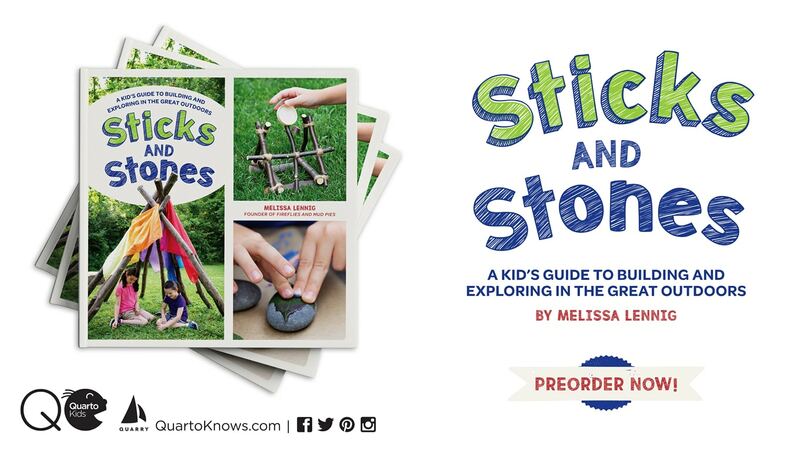 Are you following our Arts and Crafts for Kids board on Pinterest? I make homemade paint because I can. There is something awesome about never having to say no to an activity due to a lack of art supplies. Learning to make basic craft materials is like learning to make your own DIY Prepared Foods (like Ranch Dressing, Taco Seasoning, etc.). It feels empowering to me because I can control the ingredients, save money, and have several boredom-busting tricks up my sleeve for rainy days. 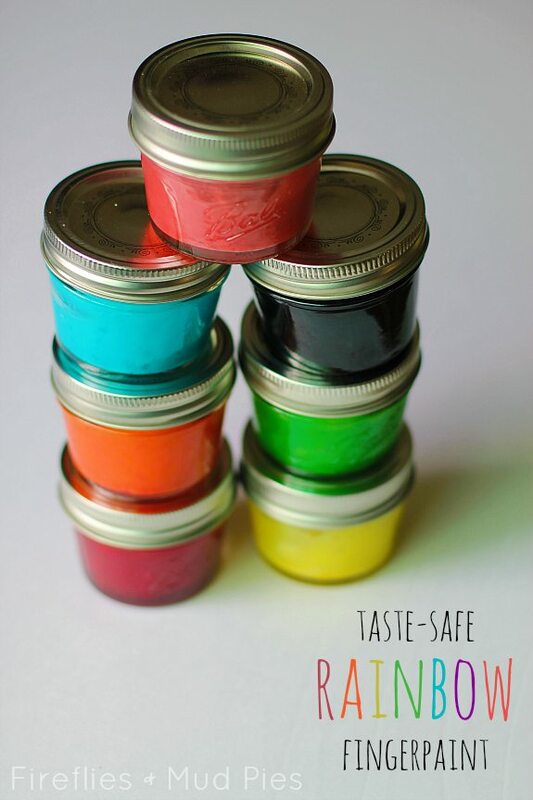 The bright rainbow paints I made for my children feel smooth and smell amazing. Unfortunately, they did stain our fingertips (the stains washed out by evening bath-time, so it wasn’t a big deal to me). They are taste-safe, but my oldest son discovered they taste extremely sour! If your little one licks the paint, he won’t want to a second time! My oldest son painted fruit. His red fingertips are proof that he mostly used red, creating large, shiny strawberries with sesame seed seeds. 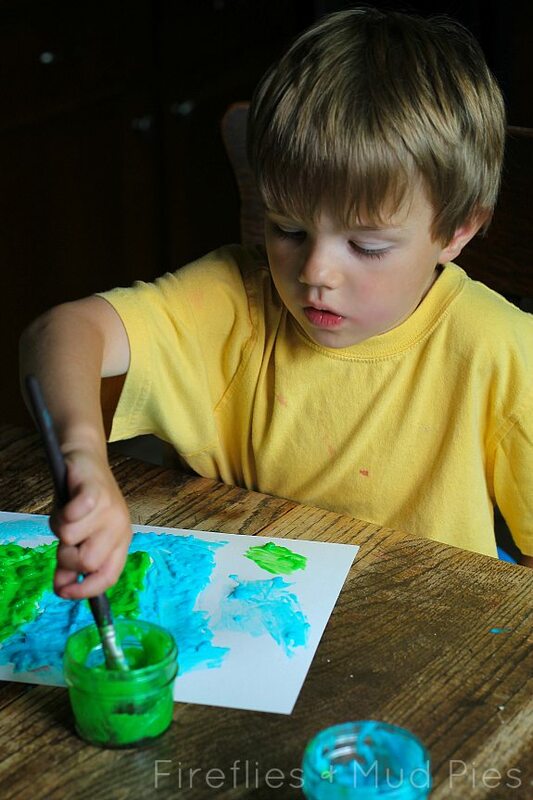 He found this art activity to be very soothing (which was just what he needed – he was rather cranky today!). Want to make your own? Of course you do! It’s easy and fun, and the kids can help too! 1. Distribute 1 packet of Kool-Aid per mason jar. 2. Combine the gelatin and 1/4 cup of water in a small bowl. Allow the solution to rest for several minutes. 3. Pour the cornstarch and 3 cups of water into a small saucepan. Heat and stir constantly until the mixture thickens. Whisk in the gelatin solution with a fork until combined. 4. Divide the mixture evenly among the jars. Stir well with a popsicle stick. We my youngest child used all of our paint, so I can’t estimate a shelf-life. If I was to store this paint, I would refrigerate it. My guess is that it would gel slightly, if not completely, so you may have to reheat and/or add additional water before reusing. Kids will love figuring out how to thaw this frozen ice paint. Perfect for any season! In this post, you will learn how to create lovely marbled milk paintings. 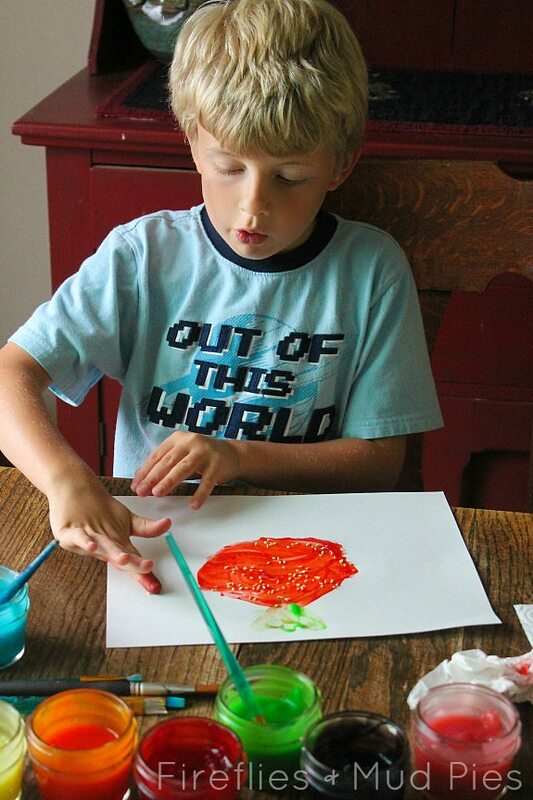 Create some wicked works of art by blasting liquid watercolors through squirt guns. See how to create homemade paint using basic pantry staples. In this paint recipe, Nature provides the ingredients!